We organized this webinar, because we know that many Jira users frequently need to share some of their Jira issues and their contents during their daily work. This could be because of the boss who only wants her reports delivered without logging into systems, some of your colleagues or business partners who need information presented in a special format. In our webinar we introduced the Jira app called Better PDF Exporter as a solution to this need. We walked through the steps that you typically should take after installing the app. We explained how you can export a single issue and multiple issues to PDF, as well as Jira dashboards. Many export and report examples were presented in order to demonstrate the infinite flexibility of Better PDF Exporter. Then we looked at what administration options are there, and how you can use automation options (mainly by utilizing the Automation for Jira and ScriptRunner for Jira apps) to make your job faster and more efficient. Finally, we mentioned our technology partners, other Jira apps that Better PDF Exporter integrates with. 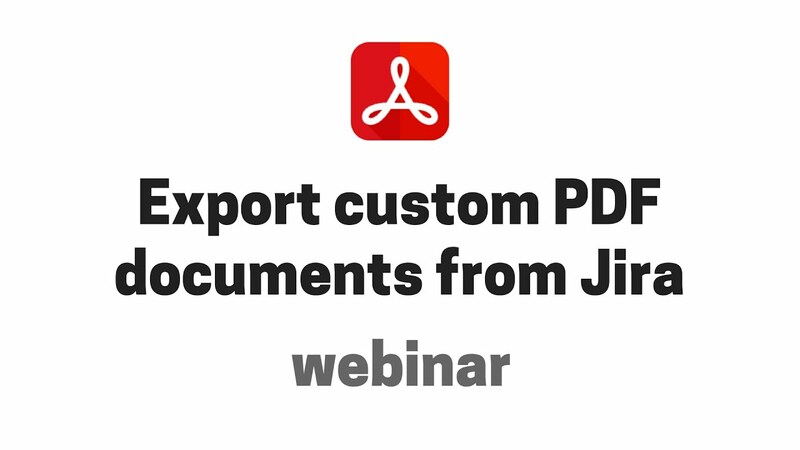 If you watch the webinar recording, you get a really good understanding of what Better PDF Exporter is best at and if it's the best Jira app for your use case. Q: Is it possible to export more than 1000 issues? A: Yes, it's possible. To prevent overloading the server, Jira has a limit on the number of issues that can be exported in one go. You can change this setting in the Jira config file, by following our step-by-step guide. Q: Is Better PDF Exporter available on Jira Cloud? A: The Server and Data Center deployments are already available, and we can tell you that we are actively working on the Cloud version. Please subscribe to our blog to get notified about product news. Q: I tried to export Chinese characters, but got hashmarks in the exported PDF. Is it possible to set a custom font? A: Yes, it's possible. You saw hashmarks, because the font you are using for your PDFs does not support those special characters. You need to set a font family that includes the characters you want to use. You can find an easy-to-follow guide that helps you set this up in the Better PDF Exporter's documentation. Q: I tried to export a dashboard gadget at it didn’t work. Why? A: The most popular gadgets are all supported, but their number is growing. There are gadgets provided by third-party apps, that are not yet supported. Please browse the feature requests for Better PDF Exporter and vote on the feature request for the specific gadget that you would need. If there isn't a feature request for it yet, please drop us a line and we will create one for you. Start a free trial of Better PDF Exporter for Jira now!